A quick color theory lesson. When you mix colors, you are at all times adding more light or darkness. Additive colors become brighter: red and blue make purple, yellow and red make orange, all of these ultimately becoming white. Mixing Subtractive colors makes them darker. Yellow and magenta make red. Yellow and cyan make green; enough mixtures over time becoming black. Now – for whatever ungodly reason, I enjoyed this concept so much that I made a little color… Tool? Visualizer? Appli- this Objet D’art was a legitimate engineering challenge because I had to take color – an intuitive affair – and translate it into mathematics, something that requires a fair bit of mouth-breathing from me. I have but two regrets with this project. The first, my apologies for the Mystery Meat Navigation™, defined as not knowing what a button does until you roll over it – a rather breathtaking faux-pas in Graphic Design circles. My second regret is that Flash 5 (which I was using at the time) isn’t great at interpreting Subtractive colors in this way. But at the end of the day, it’s butterflies changing colors… truly, how demanding can the Auteur be? 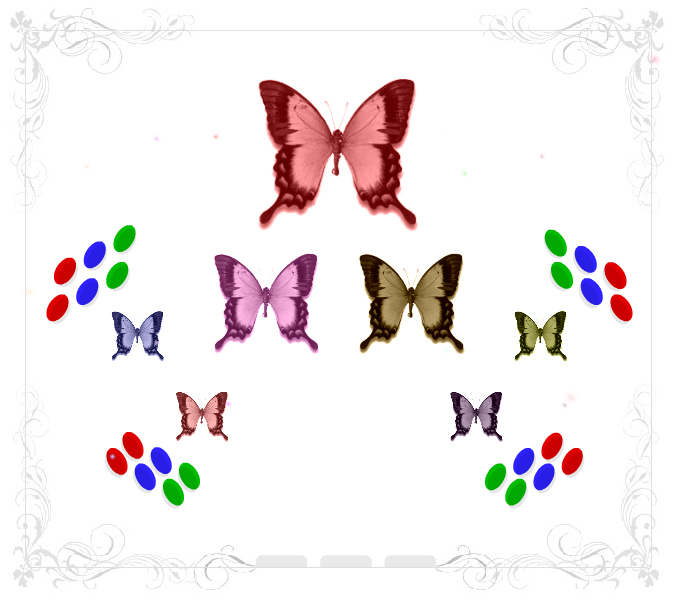 "Parent" butterflies inherit colors from their "Grandparents". The "Child" inherits the color values of the entire lineage.